It was to Shakespeare’s “Henry V” that Cory Carranza turned for words to honor his fallen combat buddy, Sgt. Paul Tokuzo Nakamura, on June 21 at the dedication of the Sgt. 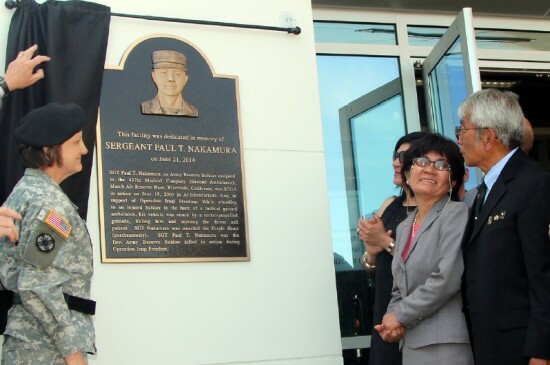 Paul T. Nakamura U.S. Army Reserve Center in Los Alamitos. Carranza and Nakamura were transporting a wounded soldier south of Baghdad on June 19, 2003 when their ambulance was struck by a rocket-propelled grenade. Nakamura was killed as he was aiding their patient in the rear of the ambulance. Carranza said that although he only knew Nakamura for two years, he continues to have a lasting impact on his life. “The last thing I said to him before they took him to the hospital to bring here to the States is that I have two lives to live now,” said Carranza, who named his son in honor of Nakamura. More than 300 gathered to pay tribute to Nakamura, a 21-year-old soldier who loved video games, classic cars and swimming, at the unveiling of the new Sgt. Paul T. Nakamura U.S. Army Reserve Center. 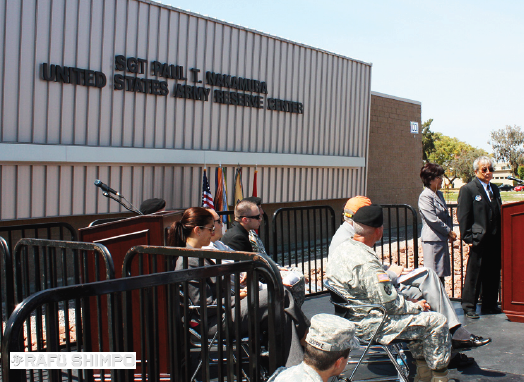 Located on the Joint Forces Training Base, the $12.9 million facility will provide training, administration and public space to approximately 200 soldiers, civilians and contractors who provide mission support for the U.S. Army Reserve 79th Sustainment Support Command (SSC). Maj. Gen. Megan Tatu, commanding general for the 79th SSC, said that during the planning stages, Nakamura’s parents often asked why their son was selected for the honor. Nakamura grew up in Santa Fe Springs, where he attended Santa Fe Springs High School and later was hired by the city as a swim instructor and life guard. He joined the Army Reserve in late 1999 and deployed with the 437th Medical Company (ground ambulance) to Camp Arifjan in Kuwait in January 2003. Family members in attendance at the ceremony included his parents, Paul and Yoko; and sisters, Miki Stensel Morales and Pearl Naomi Estuar. Santa Fe Springs Mayor Juanita Trujillo shared that Nakamura taught her daughter how to swim at the Santa Fe Springs Aquatic Center. The mayor declared the day “Paul Nakamura Day” in the city. 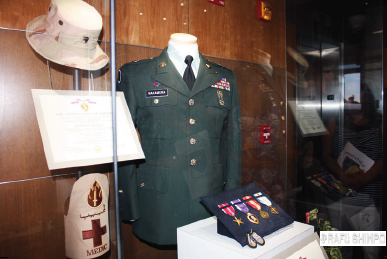 A glass case in the entry displays Nakamura’s uniform and the medals he received, including the Bronze Star, Purple Heart and the Combat Medical Badge. Retired Maj. Gen. Robert Ostenberg commanded the 63rd Regional Support Command, including Nakamura’s unit, and observed him in training. “The other ambulance crews were struggling a little bit and I saw Paul trying to help correct some of their mistakes and I was very impressed with him,” Ostenberg said. A Vietnam veteran, Ostenberg noted that in Vietnam for every three wounded soldiers, one would perish; while in Iraq out of every nine soldiers, one would die. Overcome with emotion, Paul and Yoko Nakamura stood together to thank the gathering. Yoko shared a dream she had recently of her son, whom she called Toku. Paul was a great guy. I went to basic with him and if you have the picture of the platoon I am holding the guide-on in front. He always smiled and had kind words for everyone. I had left service and did not keep in touch as we went on our paths but I have never forgotten him and was tore up when I stumbled upon his picture on CNN home and away tribute page. I am so sorry but glad he is being honored in so many ways. He was an inspiration then and now. A hero that took on a soldiers role but took it one step further becoming a medic and risking his life to save the lives of others. He is the true embodiment of the Army’s Selfless Service. I miss my friend and battle buddy. Rest Well Sgt Paul T. Nakamura.